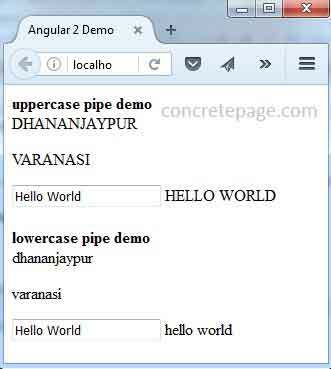 On this page we will provide angular 2 uppercase pipe and lowercase pipe example. Angular UpperCasePipe transforms string to uppercase and LowerCasePipe transforms string to lowercase. It is used as follows. UpperCasePipe uses uppercase keyword to transform string into uppercase as given below. Here message is a component property. LowerCasePipe uses lowercase keyword to transform string into lowercase as given below. Now we will discuss UpperCasePipe and LowerCasePipe example step by step using typescript. UpperCasePipe is a PIPE that transforms string to uppercase. It relates to CommonModule. Find the syntax of UpperCasePipe as below. The expression result will be converted into uppercase. Find the example. LowerCasePipe is a PIPE that transforms string to lowercase. It relates to CommonModule. Find the syntax of LowerCasePipe as below. The expression result will be converted into lowercase. Find the example.